I'm a huge fan of caddies that contain beauty products. Maybe it's just me hearkening back to my college days, carrying a bunch of products to and from the communal bathroom each morning, but I just really love them. And this one by C.O. Bigelow is so wonderful, I just had to feature it today in Two-For Tuesdays! C.O. Bigelow's Lemon scent is one of my all-time favorites. It's so fresh and clean, and while it's citrusy, it refrains from being too tart. I just used up my Lemon hand wash in the bathroom and when I came across this caddy I got so excited -- because now it comes packaged with a Hand Lotion in the same fantastic scent! The Hand Wash is created with lemon oil and extracts and a ton of Vitamin C to keep hands feeling soft and smooth ... and it gives a seriously great lather with only one pump! The accompanying Hand Lotion is formulated with lemon extract and Vitamin C to, again, keep hands super-supple ... and it even contains shea butter and kukui nut oil, which means your hands will just be silky smooth after every application! I honestly can't say enough good things about this scent or the two products -- I've used both a ton in the past and have never been disappointed. This particular set has since been discontinued, but you can find many other fabulous lemon scented products at bigelowchemists.com. Ooh, this would look fantastic in my bathroom when I use up my Method soap! I loveeeeee C.O. Bigelow's Lemon everything so this is great! I've never tried the C.O. 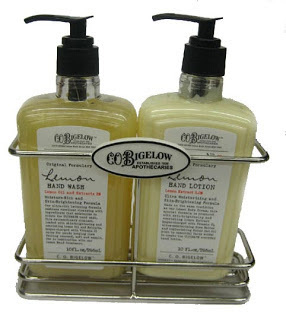 Bigelow hand soap...but the caddy with the two products would look great by my kitchen sink! I love the Lemon Hand Soap! And now a lotion too!